Many countries’ lesser-known indigenous red grapes produce highly tannic wines that are sometimes a little difficult to approach. 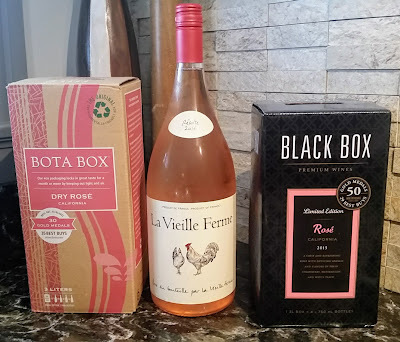 Faced with such a situation, some producers are augmenting the production of these wines in a way that makes me quite happy: rather than just making straight reds, they’re turning some of these harvests into rosé. Other wines from these two producers, Mezzacorona and Stemmari, are fairly ubiquitous in wine shops across the country. Both make solid table wines, and I’ve written about some of these in the past. These wineries are located at different ends of Italy. Mezzacorona produces wines from near Trento in the mountains of northern Italy, while Stemmari’s wines are sourced from grapes grown in southern Sicily. To give some perspective, the Mezzacorona vineyards are on a line, latitude-wise, with Mt. Rainier in Washington. Stemmari’s are approximately at the same latitude as Napa. This difference in geography, not to mention terroir and grape type, means that these wines should display significantly different characteristics. Both these wines are produced in the traditional rosé method. Once the grapes are picked, they undergo a process called “cold maceration.” Cold maceration means that the grapes are lightly pressed and the juice is left in contact with the skins and stems for a brief period of time – 6-8 hours for the Mezzacorona and 12 hours for the Stemmari. This allows the juice to pick up some of the color and flavor from the skins. This pleasant enough quaffer is made from the Lagrein grape, which usually makes tannic, chewy reds reminiscent of Syrah. Made into rosé, however, this version of Lagrein makes a pink that’s light, fruity, and straightforward. I found plenty of strawberries on the palate along with a fairly mild citrus. The finish isn’t overly acidic for rosé. I hoped for a little more zip, but I thought it was good, middle of the road wine. The Sweet Partner in Crime deemed it “fine.” In other words, it’s a decent enough, uncomplicated wine that would pair up with a broad variety of foods that aren’t overly rich or fatty. Pork, light pastas, or grilled salmon would be decent matches. 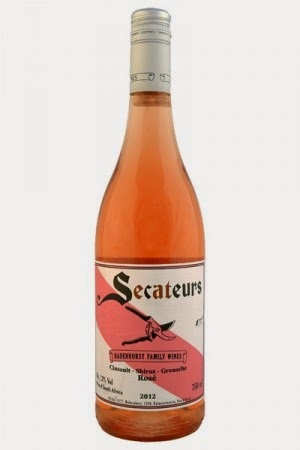 There are certainly rosés we liked a bit more, but for $10, it’s worth a go. 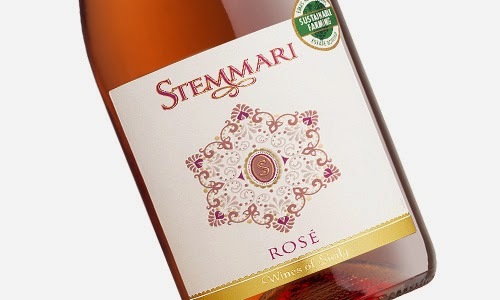 Stemmari 2014 Rosé – From the southern coast of Sicily comes this slightly darker, somewhat richer offering. The Stemmari is made from 100% Nero d’Avola grapes. Nero d’Avola, as you might remember, is the best-known and most widely-planted grape varietal in Sicily. Nero d’Avola also produces powerful wines that should be cellared for at least a couple of years to let the tannins calm down. There’s no need for this kind of patience with rosé, however, and the resulting product is quite reflective of the grape that gave it birth. Of the two wines, this one has a little more muscle. Beyond the color, this rosé has more pronounced fruit flavors, although the strawberry backbone is common between the two. There’s more mineral notes here, which is no surprise considering the volcanic soil of Sicily. The finish also has a little bit of a tannic characteristic that I found somewhat more interesting. I would think this would go just fine with some richer dishes. We had this with a roast pork tenderloin with a glaze I made out of some huckleberry jam that came from our local CSA. It stood up to the flavors well enough. For a change of pace from reds with a bigger-flavored springtime meal, it’s another workable $10 option. Neither of these wines are anything that I’d consider complex, but the whole point of rosé is enjoyment, not deep thought. I would give the slight edge to the Stemmari in this side-by-side, but my palate’s still somewhat in winter mode. I might flip-flop if you asked me in a few months. Regardless, nice to see better quality-yet-still inexpensive rosé emerging from Italy as an alternative to the aforementioned rosé triumvirate.